For one reason or another you need to set the database used by entity framework programatically. The more common way of doing such a thing is to set the database in your web.config class, but for whatever reason you need to set it in actual C# code. There is no cause really, it is merely the way that entity framework and sql server work together. The answer lies in setting the constructor properly. 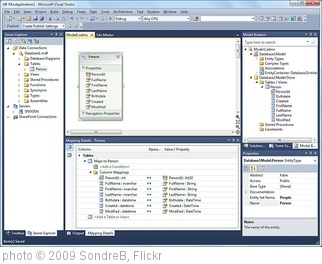 The above would be your data context file that uses the DBContext file in your models folder, just fyi (that is the common place for Entity Framework models in the standard Visual Studio 2010 web solution structure). This entry was posted on Tuesday, April 24th, 2012	at 6:32 pmand is filed under ASP.net, ASP.net MVC, Code Samples, Entity Framework, How To Fix, Programming, Uncategorized	. You can follow any comments to this entry through the RSS 2.0	feed. You can leave a comment, or trackback from your own site.